Happy Winter Solstice! We are feeling the excitement in our home as Christmas is just a few days away. My preschooler checks the tree every morning to see if Santa has visited. The boys have been busy creating holiday gifts and being kitchen helpers. The youngest loves to taste everything from a mixing bowl; even the french bread dough is tasted with enthusiasm. He then declares, “Mmm, good Mama!” If only that same zest was for the finished meals on the table. I enjoy making the cookies I had as a child every Christmas. Breaking from tradition, it was my goal to bring you all something that was vegan and more allergen friendly for your holiday cookie plates. This recipe is just that. 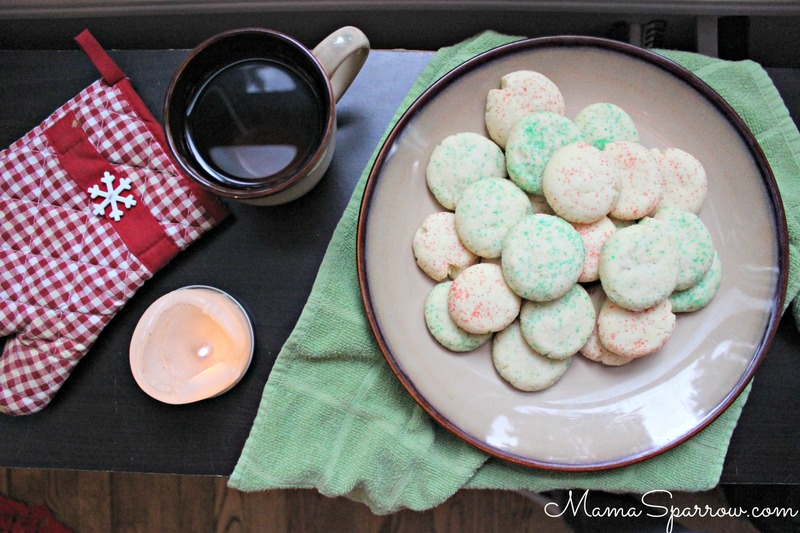 Peanut butter blossom cookies were the inspiration for this recipe. Tender, crumbly shortbread cookies are the perfect vehicle for combining peanut butter and chocolate. Flecks of sea salt flakes add a little bit of sparkle and bring out the chocolate taste. They are easily nut free if you use sunflower seed butter and refined sugar free. Here’s to hoping you have a chance to add this to your baking plans this season. Snap a picture of your recipe result and tag Mama Sparrow on social media so we can see it too. 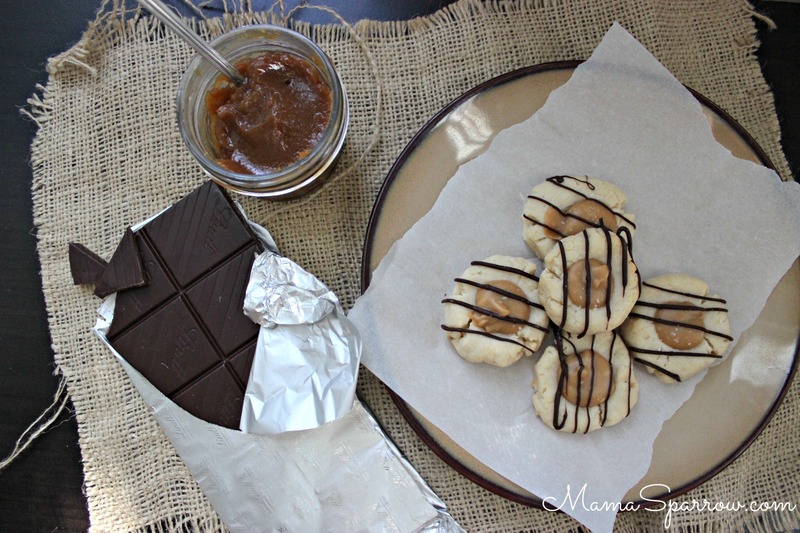 Tender, crumbly shortbread cookies filled with peanut butter and drizzled with chocolate. These tasty treats are vegan, easily nut free and refined sugar free. Preheat the oven to 375 degrees F. Mix all cookie ingredients together in a medium bowl until dough forms. Form form into ¾ in. - 1 inch balls - approximately 12-15 cookies. (Chill the dough briefly in plastic wrap if it is too sticky to work with.) Place on a parchment or silpat lined baking sheet. Flatten the dough balls into slight discs and press thumb in the center to create a little crater. Bake cookies for 10 minutes until lightly golden brown. Remove from oven and repress the centers with a spoon. Then allow the cookies to cool. To assemble to cookies, spoon about 1 teaspoon of the peanut butter confection into each cookie’s thumbprint. Drizzle chocolate over the filled cookies and lightly sprinkle with coarse salt. Store in an airtight container in the refrigerator for a few days for up to 3 months in the freezer. Nut free option: Use Sun Butter. Really you could use any preferred nut or seed butter. I did try pumpkin seed butter and it was not quite as tasty. We had our first snowfall of the season earlier this week. A brief glance out the back window of the apartment and I caught an old longing. It was that penchant for winter night photographs. The soft light from surrounding houses and general urban aura accentuate the starring features of winter photography – contrast and texture. It is moments like these, passions remembered and fascinations reacquainted, that illuminate with reasoned existence. This recipe harkens memories of my mother’s famous meat spaghetti. She never made less than a crowd’s worth when cooking her spaghetti. The sauce simmered and noodles boiled. Meanwhile, loaves of crusty, french bread were buttered, seasoned and broiled open-face, till toasty and fragrant. The real secret to this vegetarian version is the spices and the texture achieved from the pan cooked cauliflower. This pasta dish is about as cozy as they come and a sure crowd pleaser. We fully recommend an accompaniment of crusty bread. We hope you try this recipe soon. Be sure to take a picture and tag Mama Sparrow on social media so we can see the results. 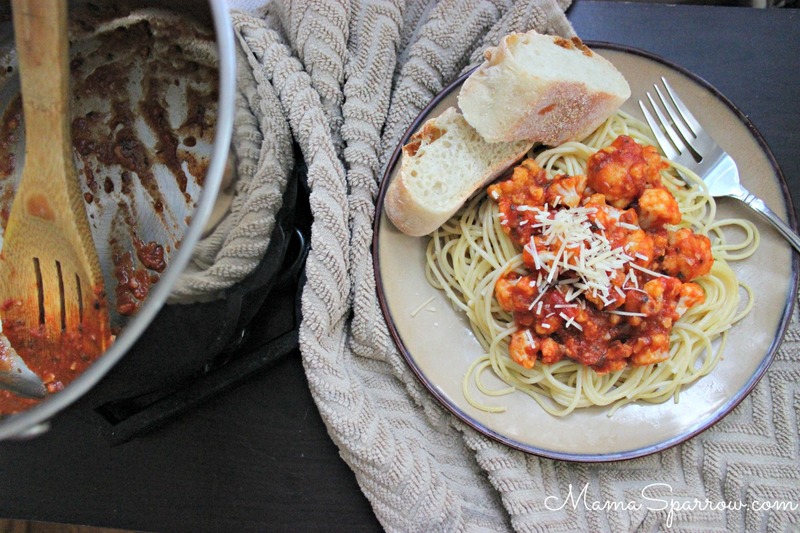 A traditionally meaty sauce converted to a vegetarian delight. Grab a loaf of crusty bread. This is your next cozy pasta meal. In a medium mixing bowl, mix together spices and 1 tablespoon olive oil. Add the cauliflower and toss till the cauliflower is covered in the oil and spice mix. Set aside to marinate for 30 minutes. Heat 1 tablespoon olive oil in a medium saucepan over medium-low heat. Add the seasoned cauliflower and reduce heat to low. Cook the cauliflower until tender on the outside with a slight crunch on the inside. May take 10-15 minutes. Splash in water to speed up the cooking and keep the cauliflower from drying. Once the cauliflower is cooked, add in the pasta sauce until warmed through. Serve over spaghetti noodles.